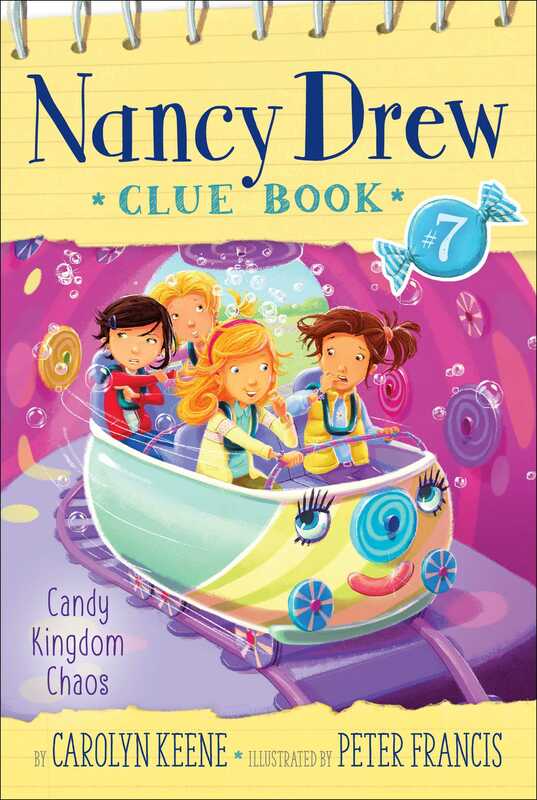 Help Nancy and her friends solve a sweet mystery at the new Candy Kingdom amusement park in the seventh book in the interactive Nancy Drew Clue Book mystery series. The new Candy Kingdom theme park is opening in River Heights and Nancy, Bess, and George can’t wait! The park is supposed to have candy-themed rides, attractions, arcade games, and more, so when Bess wins four free passes to the park, she invites Nancy, George and their good friend, Nadine Nardo to check it out. But Nadine’s wristband goes missing after the first ride! Nancy and her friends know that all of the wristbands were tied securely, so it couldn’t have just fallen off. Can Nancy, Bess, and George track down the stolen wristband before their sweet day at Candy Kingdom turns sour? “Spring break—here we come!” eight-year-old Nancy Drew cheered to her two best friends. Nancy thought they were all lucky to be at the mall that Friday afternoon. It was the last day of school before spring break. It seemed like every kid in River Heights was there for the Candy Kingdom contest. Candy Kingdom was a new amusement park opening in River Heights the next day. It would have candy-style rides and candy games—even candy characters, like the superfamous Sour Power Pals! “The coaster or our stomachs?” George joked. The girls turned their faces toward the stage set up in the atrium that day. Bess and George weren’t surprised. Nadine Nardo was the class actress, dancer, singer—and sometimes drama queen! As the mall filled up with more kids, Nancy felt someone tap her shoulder. Turning, she saw Andrea Wu, another classmate. If Nadine was the class actress, Andrea was the class candy lover—and proud of it. “Hi, Andrea,” Nancy said with a wave. “Even when we’re not solving mysteries,” Bess added. Everyone at River Heights Elementary School knew that Nancy, Bess, and George were the Clue Crew, detectives who solved mysteries at school and all over town. Nancy was proud of all the mysteries they had solved so far. She was also proud of her Clue Book where she wrote down all their suspects, clues, and thoughts. “So that leaves one more Candy Kingdom pass for another friend,” Andrea said with a grin. “Like me! And you know how much I love candy. See my earrings made out of real jelly beans?” Andrea tugged her earlobes. Someone had dangled a wiggly spider in front of Andrea’s face. When Nancy, Bess, and George heard a familiar snicker, they knew who it was. “Antonio Elefano!” Bess snapped angrily as their grinning classmate stepped out from behind Andrea. If Nadine was the class actress and Andrea was the class candy lover, Antonio was the class pest. “It takes a pest to eat one!” Andrea snapped as she huffed away. Nancy, Bess, and George wanted to move away from Antonio too, but an excited roar suddenly filled the mall. It was Mayor Strong being led onto the stage by two Sour Power Pals! Besides the candy, the Sour Power Pals had their own cartoon TV show. On it they acted as sour as they tasted. “You mean tart,” George joked. “There’s Nadine!” Nancy shouted as a half dozen kids in candy costumes tapped to the middle of the stage with their arms looped together. Nancy, Bess, and George danced to the beat—until something horrible happened. Nadine’s giant green gumdrop tipped forward and covered her eyes! With both of her arms still looped, her hands weren’t free to push the gumdrop back up. “Like a klutz!” George groaned. But to everyone’s surprise Nadine kept dancing in perfect step with the others. After the music ended, she even took the perfect bow! “Nadine nailed it!” George cheered. “And we deserve a break from Antonio Elefano!” Bess complained as she brushed another Gummy Pest from her face. The Tippy-Toe Tappers were replaced onstage by the king and queen of Candy Kingdom. Instead of jewels, their crowns and scepters were adorned with colorful candies. “But do not open them until I give the royal thumbs-up,” the queen added. Carrying big bags of chocolate bars, the Sour Power Pals made their way through the crowd. Nancy, Bess, and George each took one bar. Bess narrowed her eyes at Antonio. “If we swap, will you go away and leave us alone?” she asked. “Deal,” Bess said as she made the switch. “Bess, what were you thinking?” George asked as Antonio squeezed through the crowd away from the girls. “What if you gave Antonio the winning chocolate bar?” Nancy wanted to know. Nancy scrambled to tear off the wrapping of her chocolate-marshmallow bar. She frowned when she found no gold crown inside. George’s chocolate-raisin bar was crown-free too. But when Bess tore open hers, she let out a gigantic squeal. Nancy and George were about to cheer too. Until someone reached over Bess’s shoulder and snatched the gold crown right out of her hand!